The scriptures today appear as links, and I really hope you’ll take the time to read each one; especially since the theme today is about using your Bible to the fullest. 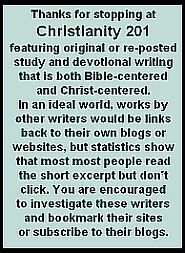 This is from the website Unlocking The Bible where it appeared under the title 14 Ways to Use the Bible. The Bible is wonderful because it gives us a knowledge of God, of men, of the universe, and of redemption. No other book can be compared to it in this respect, but it not only informs us about these important truths, it also tells us what we are to do with it. We have within the Bible itself instruction as to our attitude toward it. 1. Read it.Nehemiah 8:8. And may I suggest that it be read slowly, carefully, prayerfully, in large portions, repeatedly, reverently and with a willing spirit to follow its precepts. 2. Believe it.Romans 10:8. Because it is the Word of faith. It has been given to increase our faith in God and His working in the Universe. 3. Receive it.James 1:21. Here it is the engrafted word that is to be received as the soil received the seed, or the tree receives the graft. 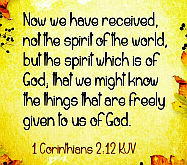 Taking the Word of God in our heart life, allowing it to grow and bear its own fruit in motives and actions. 4. Taste it.Proverbs 19:10. For it is the good Word of God. Some seem to be afraid of the Bible for fear it will require them to do something they do not wish to do. Be not afraid; it is good and right in all its requirements. 5. Eat it.Jeremiah 15:16. This process suggests that we not merely taste but actually live by it, as Jesus said, “Ye shall not live by bread alone, but by every word that proceeds out of the mouth of God.” Matthew 4:4. 6. Hold it fast.Titus 1:9. It is a faithful word. All its promises are true; all its history is true; and its statements are truth. Therefore we are to rest our faith upon it. 7. Hold it forth.Philippians 2:16. Because it is the Word of Life. All who come under its beneficent rays feel its life giving power. 8. Preach it.2 Timothy 4:2. Here it is called simply the Word. It suggests that we are not to preach any one part of it or any one phase of it, but preach it in its entirety and fullness. 9. Search it.John 5:29. This suggests work and patience. The Greek word carries the idea of “ransack” as the housewife goes through the home at housecleaning time; or “to track” as the hunter laboriously follows the game through the brush, so we are to search for truth and run down the lines of God’s revelations to man. 10. Study it.2 Timothy 2:15. Here is a word that means close application to the Word of God, as the builder minutely studies the plans of the architect before erecting the structure. 11. Meditate on it.Psalm 1:2. This word has much the same meaning as “eat” for it means literally “to chew the cud.” Turning the Word of God over and over in the mind till the sweetness of its truths feed our souls. 13. 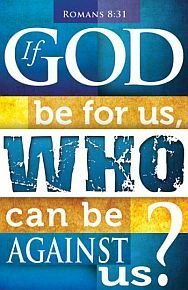 Rightly divide it.2 Timothy 2:15. 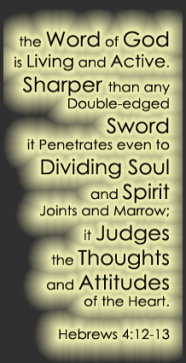 This is not an arbitrary division of subjects but the following of a line of truth from the first place mentioned to the last place mentioned; noticing it in all its relation to other truths and as the word literally means “the cutting of a straight line” of truth in the Bible. 14. Delight in it. Psalm 119:92. Seven times in this Psalm the Psalmist speaks of delighting in God’s word. This should always be the heart ambition and attitude. Deep in thy heart let its precepts dwell. None can e’er prize it too fondly or well. *Adapted from portion of W.H. Pike’s beginning remarks in Summarized Bible: Complete Summary of the Old Testament. I know that this type of article isn’t typical of what we do here at C201, but as long as we’re doing lists, here’s one that appeared a few days ago the blog Deep Thoughts by Gman under the title Old Versus New. Repeated yearly vs. Completed by Christ’s death. Available to some vs. Available to all.